Your favorite festival returns to downtown Tucson this fall, but this year on slightly new territory. Ready for a downtown block party? 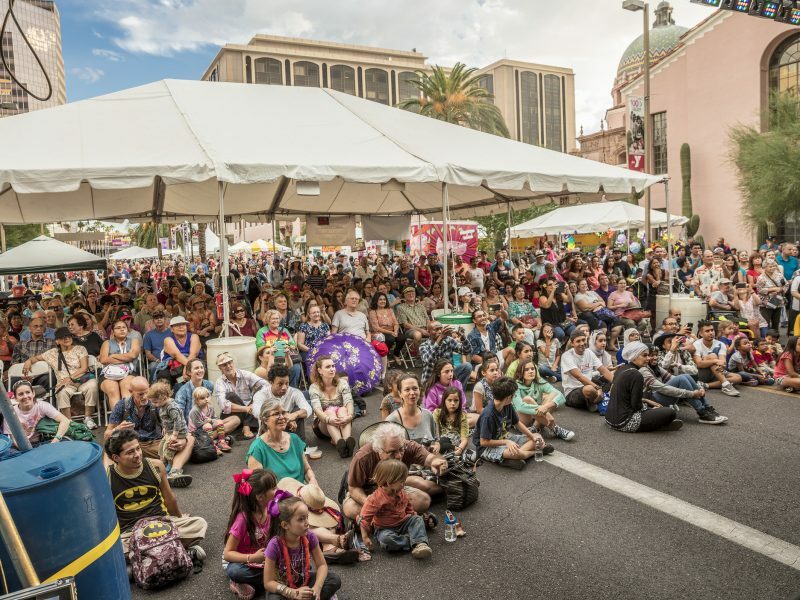 This year, we’ll surround the Tucson Public Library, running along North Stone and Church Avenues, between Congress and Alameda, and on Pennington Ave. We’re excited to continue animating downtown streets alive through cultural sharing. The festival has had a long history in El Presidio Park. It’s where it all began in 1974 with performances at the City Hall stage. Many of your favorite food vendors and cultural clubs have held the same popular locations in El Presidio for decades—Club España, Club Colombia, the Turkish Sema Foundation, and so many others. But, we’ve grown so much! In recent years, we’ve hosted over 100 performers, 100 folk artists, 50 food vendors, and 120,000 attendees, extending from El Presidio Park to Jácome Plaza and beyond. El Presidio Park can no longer sustain the weight of the event due to the underground parking lot. When the City notified us that it would no longer issue a permit for use of the park, we immediately began working with event and traffic officials to devise a new plan. Current plans involve closing Stone Ave. from Alameda St. to Congress St. from Wednesday, October 10 through Sunday, October 14. “The new set up will allow Tucson Meet Yourself to create a central gathering event area with a variety of stages with entertainment,” said Greg Jackson, Management Coordinator at the City Manager’s Office, who worked with festival organizers to establish the new area. So no worries. You’ll still have plenty of ways to access favorite food vendors and watch your favorite performers. And we’ll post a map soon to help you find your way to the festival easily. Tucson Meet Yourself takes place October 12, 13, and 14. By the way, applications for performers, exhibitors in the Community Matters area, and Food Vendors are now open. More information and links to applications can be found online at TucsonMeetYourself.org.